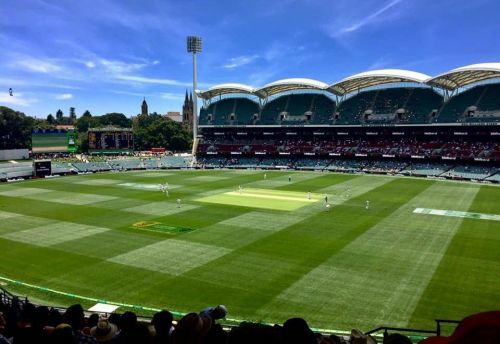 The India-Australia Test series got underway with the first match that began earlier today at Adelaide. From 87.5 overs, India have scored 250 for the loss of nine wickets. Day one went to Australia due to their all-round performance on the field. Meanwhile, India relied on one man - Cheteshwar Pujara. The trusted number three batsman batted through a top-order collapse, forged a vital partnership with Ravichandran Ashwin in the lower middle-order and got out in the very last ball of the day. But not before scoring his 16th Test hundred and third against Australia. Earlier, KL Rahul, Murali Vijay, Virat Kohli and Ajinkya Rahane were back in the hut just as 41 runs were added. Then it looked as if Rohit Sharma first and Rishabh Pant later would stick at the middle and help Pujara battle the Australian bowlers. But both batsmen fell after giving ample hope and it was up to Pujara to do all what he could. Credit should be given to Ashwin, Ishant Sharma and Mohammad Shami, who helped the Saurashtra batsman add 123 runs on board for three wickets together. Meanwhile, each of Australia's pace battery (Starc, Hazlewood, Cummins) and spinner Nathan Lyon ended the day with two wickets apiece. India will go out to bat on Day 2, with a lone wicket remaining and with Jasprit Bumrah coming out to partner unbeaten Shami. Here are the main talking points from the opening day's action at Adelaide. As mentioned earlier, the Indian contingent's biggest insurance in games at any part over the world is the strength (in paper) of their top order. Names like Murali Vijay, Virat Kohli, Ajinkya Rahane and Rohit Sharma do elicit respect from any rival team. But just like in Team India's recent ordeals at South Africa and later in England, overseas batting surfaces continue to be a burial ground for these high-profile batsmen. Add KL Rahul and Rishabh Pant to the above list, and what we can see is a terrible meltdown from the part of these guys today. Amid calls to promote limited-overs opener Rohit Sharma to the same role in Tests, skipper Kohli stuck with his plan to place Rahul and Vijay at the opening roles, and it did not take long for the scheme to crack. In the sixth ball of the very second over, Rahul needlessly poked at a widely moving ball only to edge it straight to third slip and go for 2 runs. 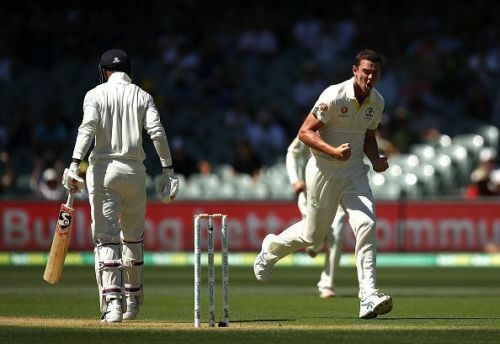 Five overs later came the next downfall as Vijay repeated Rahul's mistake, the ball eventually caught by Aussie captain Tim Paine at wicket-keeping. One would fairly expect Virat Kohli to not commit such blunders, given his superlative abilities irrespective of venues. But today was not his day either, as India's third wicket fell from yet another attempt to drive a moving ball, the catch flying away from Usman Khawaja who however leaped across and pocketed it anyways. India were then 19/3 after 10.3 overs. Rahane fell to what could have been called the worst shot of the day, had not Rohit bettered it a while later. Rahane miscued yet another drive, this time to Handscomb at second slip. The ball was really wide of off-stump, and would have been harmless if left untouched. Within just 21 overs (which meant that more than 75% of the day's play was still remaining), all that remained of India's top order was Cheteshwar Pujara, as he did his best to somehow hang in there, scorecard reading a tragic 41/4 in 20.2 overs.